The USS CLAUDE V. RICKETTS (DDG-5), a Charles F. Adams-class guided missle destroyer, was commissioned on 5 MAY 1962. 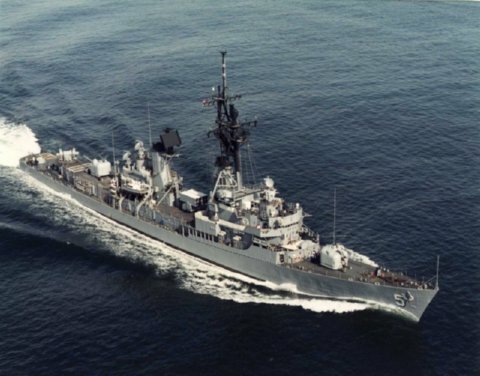 Originally commissioned as USS BIDDLE (DDG-5) and then renamed USS CLAUDE V. RICKETTS (DDG-5) on on 28 July 1964, in honor of Admiral Claude V. Ricketts, the vice Chief of Naval Operations, who had passed away July 6, 1964. An Atlantic DGG her entire career, CLAUDE V. RICKETTS deployed routines as needed from the East Coast to the "MED", "GITMO", "IO" and North Atlantic. USS CLAUDE V. RICKETTS served her country for 27 years, 5 months and 26 days, until decommissioned on 31 OCT 1989. The hulk of the CLAUDE V. RICKETTS was sold for scrapping, repossed ny the Navy and finally sold and scrapped in 2002.